This article continues on from Part 3 - Colour and Extended PCG Graphics. 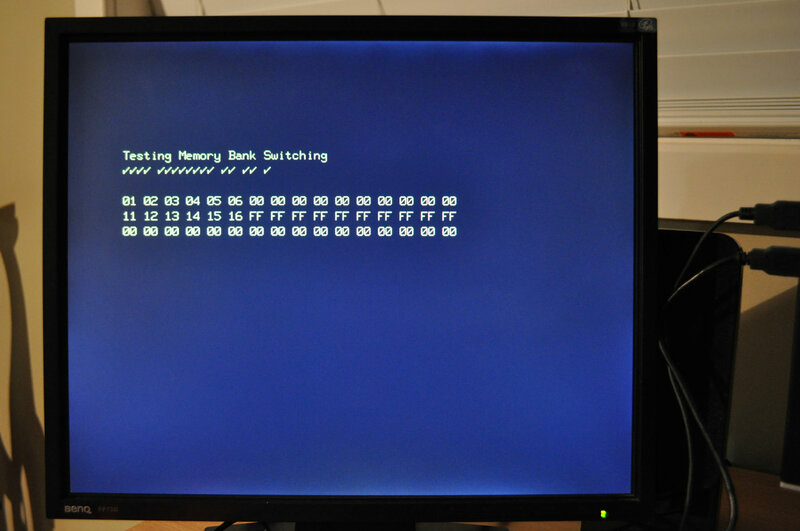 Today I managed to get FPGABee's memory bank switching working and it now has the full 128K. Previously FPGABee's main RAM was implemented as a single on-chip (ie: in the FPGA chip) 32K block RAM. While this worked well for version 1, the Spartan chip I'm using has a total of about 60K RAM available so it was time to move it off-chip and start using the Nexys-3 board's SDRAM - of which it has 16MB. Interfacing to the SDRAM is almost identical to interfacing to the flash memory and in fact they both share the same address and data lines. Switch to the external RAM basically involved some minor changes to the address decoding and data multiplexing logic and deleting the old block RAM entity. To verify this was all working I booted the old ROM Basic and ran up a couple of programs and everything worked fine. The biggest challenge to implementing the full 128K of RAM was understanding how the bank switching worked. With a total address space of 64K obviously the full 128K can't all be accessible at once and the key to all this is understanding how port 0x50 works. Unfortunately the official documentation for this is not quite correct, but managed to figure it out by reviewing the source code for ubee512 and some testing. Bit 2 - When 1 deselects all ROM packs from memory. When 0, ROM pack 1 appears at 0x8000-0xBFFF and bit 5 controls the other ROM packs. Well that's how it's documented in the technical reference manual however they neglected to mention one thing: when bit 2 is set the meaning of bit 1 is inverted. I don't know why, but that's how it is. Also, bank 0 is always mapped to 0x8000-0xFFFF unless obstructed by another of the other mapping defined above. Once I had my head around how port 0x50 worked I took a look at FPGABee's existing implementation of memory mapping and decided it was getting a bit out of hand. I had multiple places that were decoding addresses, a huge continuous assignment statement for the CPU din signals and it was just getting too unwieldy. After a bit of a redesign I came up with a structure that make the whole thing more manageable. Firstly, instead of using continuous assignment statements I used VHDL non-clock processes - allowing for more explicit if/elsif declarations of the logic. Secondly I consolidated all the address decoding to single place that decodes the current CPU address to a device (eg: ram, rom, video character ram, video pcg ram etc...) and a "translated address" - the address in the target device that the current CPU address maps to. Normally the translated address is the same as the CPU address with the top few bits cropped off (eg: the video ram is simply the bottom 12 bits of the CPU address). For ROM access however it's offset to the base location in the flash memory of where the ROM image resides. For RAM access it's offset according to the selected bank number. Again, testing this wasn't possible with full system boot so I knocked together another boot ROM to check everything looked correct. By running the test ROM on ubee512 and on FPGAbee I could confirm they were both doing the same thing. Each tick represents a passed test. Next up is the disk controller. Building FPGABee Version 2 continues with Part 4 - Disk Geometry.